The APF Imagination Machine was a combination home video game console and computer system released by APF Electronics Inc. in late 1979. 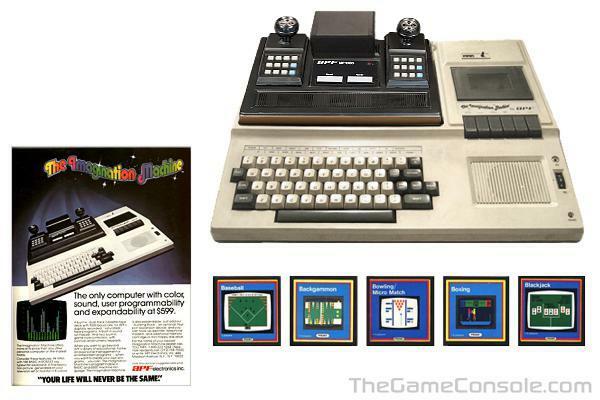 It was composed of two separate components, the APF-M1000 game system, and an add on docking bay with full sized typewriter keyboard and tape drive. The APF-M1000 was built specifically to compete with the Atari 2600. The Imagination Machine has the distinction of being one of, if not the first, affordable home PCs to connect to the television, and is still one of the most expandable consoles ever marketed. The full APF Imagination Machine, including the APF-M1000 console and the IM-1 computer component originally sold for around $700. Only 15 official game cartridges were ever released by APF Electronics Inc, and 1 cartridge that came with the console, the Basic interpreter; although several game cartridges contained multiple titles. Many games were created by an active programming community of owners and distributed through their monthly newsletter, but these were all released only on tape cassette form, or in some cases, merely as a print out of the code that would have to be typed in if it was not transferred through a copied cassette.